Official Disney EVERYTHING ELSE Because I’m Tired. I left something out of the last post! Before meeting Aladdin we went on the Pirates of the Caribbean ride. Always a favorite. Even before the addition of Captain Jack Sparrow, I enjoyed this ride. Now, with Captain Jack, my son has a laugh or two. He’s never seen the movies, as I think they are a bit too heavy for a 1st-grader, but he knows who Captain Jack is and riding this ride inspires the pirate in him. After the ride, we were in the gift shop (of course), and a “wench” from the attached dining area began calling ot Emmett. Her wrists in cuffs, she asked him to help her find a key and offered a reward. He searched and found a key! (She gave him a hint and it’s really cute where he found it, and nope, I’m not going to spoil this either.) The grateful wench gave Emmett a “real” pirate eyepatch. He wore it so long it left a line on his face, and he did not remove it when he met Aladdin and some of the other characters. In the photo with Aladdin posted on Part 2, Emmett’s eye patch is prominently displayed. It has been months since I posted about Disney and I am SUCH a procrastinator, this is just par for the course for me. To be fair, I’ve got a job, two kids, a husband, a house, and millions of responsibilities outside of this blog. Still, I wish I had mentioned each and every Disney employee by name, as was my original plan. Star Wars, Star Tours, and the Greatest Jedi who Ever Lived. So when we finally got to the Star Wars part of the trip, Emmett was chomping at the bit. He had been waiting for MONTHS to be a part of the Jedi Training Academy. We woke up early and rushed through breakfast so that we could get to the park and get in line. We arrived and had to wait in a HUGE line. Once the park opened, my husband ran with Emmett over to the line for Jedi Training. By the time he got there, all the spots were filled. We’re talking maybe 4 minutes after the gates opened. We were crushed. It turns out Disney allows all kinds of rule-breaking, as long as it’s authorized Disney VIP rule-breaking. We were an hour early but some people had purchased breakfast at the park’s restaurant in order to get in early and get in line. We didn’t even know this was an option. As a mom and a consumer, I was pissed. I believe in playing fair and when the play is fair and I play hard, I’m used to winning. I don’t like it when people – or massive corporations – cheat. I stopped a cast member who just happened to walk by. She was kind and helpful and just happened to be a higher up. She gave me the name of the director of the Jedi show and said to take that info to Guest Relations, so off I went. Once there I waited my turn between some parents who had lost a beloved teddy bear (my heart goes out to them, this can be tragic) and a little old lady who didn’t seem to know where she was or what she was doing there, though her “I Heart Han Solo” shirt suggested otherwise. My number was called and I stepped up to the Guest Relations podium to speak with Souad. Souad is a pretty lady with black hair and tan skin. She’s from Casablanca. Yes, like the movie. Ask her how many times a day she has to talk about that film and she will smile sweetly, but I’m guessing she’s tired of hearing my lame tourist jokes the minute they come out of my mouth. The movie is nothing like the place, she tells me. Casablanca is beautiful and the people there are interesting, and the movie doesn’t do it justice. This conversation roused my curiosity and I would very much like to visit Casablanca one day. It’s on my bucket list. Anyway, Souad listened to our story patiently and then excused herself to make a couple of phone calls. She was empathetic to my mommy plight, having done everything I was told to do, early and with enthusiasm, and after all, it WAS his birthday. (Yes, I pulled the birthday card, because it was true.) Souad came back to the podium with GREAT news. We were on the list for the first show!! 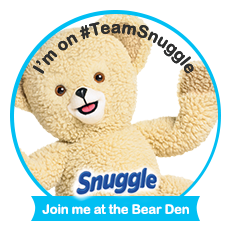 I hugged her with sincerity and we left, making our way over to the staging area. 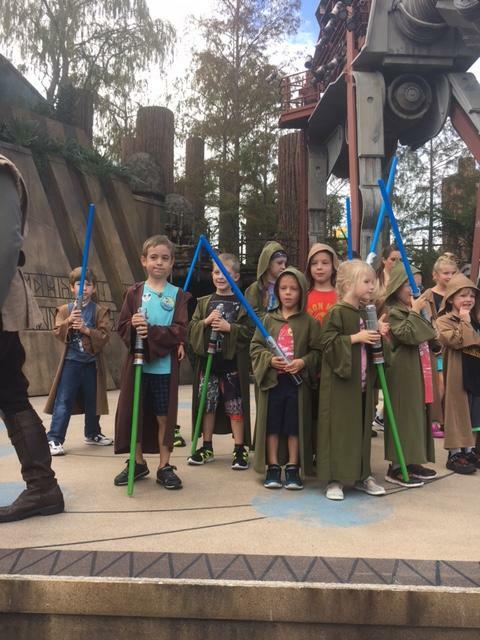 To be very clear: Our entire Disney vacation was built around this Jedi show and Emmett getting to be a part of it. I nearly cried when we were given a spot. (Now, I’m not the kind of mom who thinks my kids should have things they don’t earn, and I know sometimes life is not fair, but this was an instance that I felt like fixing it for him was ok and even necessary.) 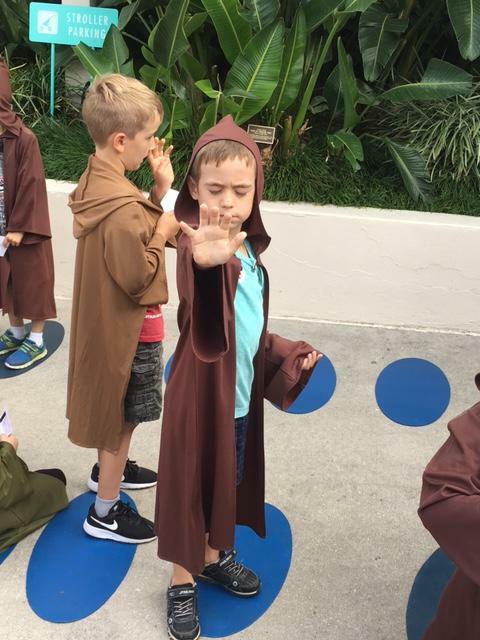 So once we were in line with the other kids and he had his Jedi robe, we started walking to the stage. Emmett is 7, and for him, this is real. This is as real as we are. I think he has, on some level, an awareness that Star Wars is just a fun story, but part of him still has that wonder and willingness to believe and I’ll do anything to preserve that for him for as long as possible. In fact, I kinda hope he never loses it. The Jedi warriors were split up into groups, given light sabers and instructions, and here we go. I joined a large crowd of parents already holding up their phones to record and photograph on the left side of the stage. The show started, and I watched with tears in my eyes as my sweet scientist, crime fighter, sensitive, courageous boy was chosen to be the first to battle Darth Vader. For us, this is fiction. For a 7 year old, this is Darth Vader, one of the baddest guys in the universe, who just arrived in a could of smoke and promised to destroy our planet. Emmett came out swinging, and I could not be prouder of his bravery. It was the coolest thing to see. My little guy has a big heart and he is already a crusader for what’s right. He cares very much about others, their feelings and their safety, and that was evident even in this moment. Once the show was over, each Jedi received a rad pin to commemorate their training and battle. It was amazing, and if there ever was an experience that flooded my heart and spirit with joy, this was it. 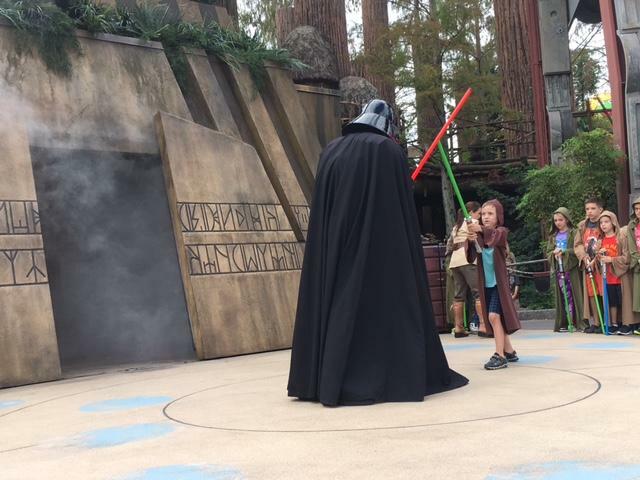 Disney is very, very good at what they do, and my little Jedi is still talking about that day. Don’t mind the gross kid. See how proud he is? The rest of our Disney trip was a blur of color, smiles, noise, and food. The teacups were, of course, the other high point of the visit, and if you haven’t tried them I think you should. We are planning our trip for this year, including some never-before-done items like character dining. Blog posts will most likely, probably, eventually follow. Next Han and Leia and Vader, Oh My!